Stuck for present ideas for a loved one? Don’t know what to buy someone for Christmas or a birthday? 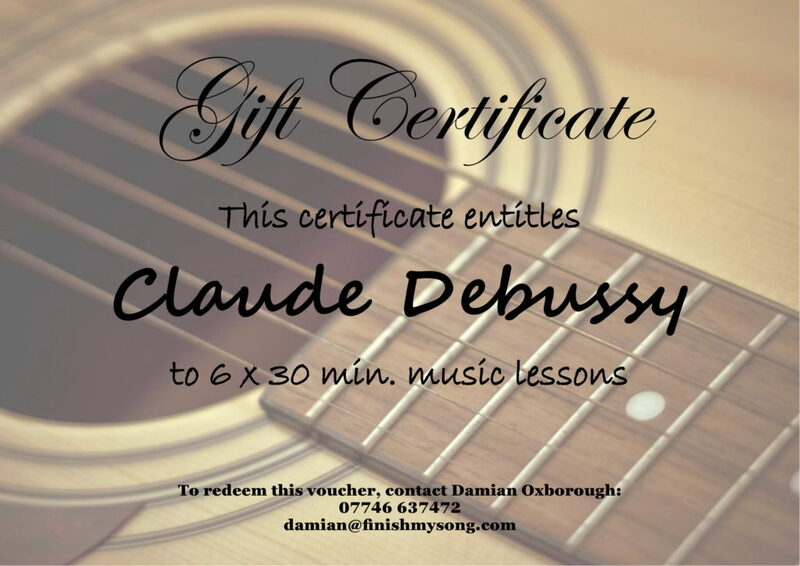 Why not give the gift of music? Learning an instrument can become a lifetime of pleasure. You can buy gift certificates any time of the year, redeemable whenever the recipient decides to book – these vouchers are valid for a full year after purchase. Before you go ahead an buy, I will check with you when the potential student is able to attend lessons and, assuming there’s space in my schedule for him/her, I will then send you a .pdf document for you to present in whatever way you see fit (see example above). You might like to slot it into a greetings card or, if the lessons come with an instrument, pop the certificate in the instrument case.